The holidays are filled with family, friend and fun! 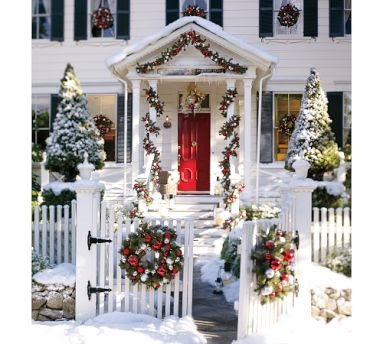 And of course, we want our homes to create a feeling of welcome for our holiday visitors. Spend time fixing up what guests will see first: your doorway and it's surrounding area. Spruce it up by sweeping, cleaning cobwebs or debris from around the doorbell and in the corners. Shake off the doormat. Remove everyday clutter such as mail, toys and shoes by stashing them in a basket in the closet. Make sure your porch lights are working well. Resurrect a planter or two from the summer garden and fill it with evergreen clippings, greenery or ornaments that will survive outdoors. Add a festive wreath or a garland with twinkle lights. Create extra space in your coat closet for your guest's outdoor wear. Temporarily move the bulk of your family's gear to a back bedroom. Add an extra doormat near the closet for wet or icy shoes. Consider bringing in an umbrella stand if it is rainy or snowy out - or just line a wastebasket with a plastic bag. Skip the heavy bathroom cleanup and focus on those things visitors will notice. Hurry and clean the toilet bowl. Set out fresh hand soaps and clean, festive guest towels. Wipe down the counter and sink. Easy-peasy! If you are expecting a houseful of guests, turn down the thermostat a couple of degrees about two hours before they arrive. So go get those houses ready for your holiday entertaining! But, most of all, ENJOY!! Great suggestions, I love the reminder to focus on things people really notice; one great suggestion to ease the holiday stress. My day is all about decorating and laundry hee hee Your post is just what I needed :) Hope all the packing is going smoothly and low stress. Great tips~ just in time for my first party this weekend! Thanks for sharing! I just found you through Lola B's, and I'm loving it already. Thanks for the inspiration . . . and happy moving! I love the part about turning down the heat...nothing worse than being all dressed up and going to home that feels like a sauna...wishing you wore your bathing suit instead! Our house always ends up the meeting place, but I'd add one thing to your list - try to get someone else to host and do all that work. LOL! I'd rather bake and wrap presents and I always end up doing it all and being so tired I don't enjoy it at all. It doesn't help that the guests don't bring presents and I can't help, but want fun present exchange so I end up buying extra so there's stuff to unwrap. I'm going to try not to this year. I invite you and your readers to see my 'house' my blog it's tidied up and welcoming at least. So much easier online, right?? I have a luncheon tomorrow and your tips are just what I needed to make sure everything is ready. Thanks! ahh...don't you just love the pottery barn catalog. I often flip through and try to steal ideas on a cheap college student budget! Thanks! This is a BIG help since we're having a Christmas party at our house Saturday. I know I can't get it "all" done so this helps me figure out what I need to really focus on! I love that I can be inspired by such talented women like yourself!